Like many of the team, the choice of picking a key album from my life was a huge decision that was ridiculously difficult. This choice was made even more problematic by the fact that I will likely be using the most obvious and special options for a feature within 'Fireworks' in the very near future... so realistically they were out. The first item I ever purchased was a double album (a cassette of Bryan Adams' 'Cuts Like A Knife' and 'Reckless')... so that didn't really fit the requirements either. Therefore, I opted to go for something that was a little more left-field. I was born in the mid-seventies with musical influences given to me by my mother that included the likes of Deep Purple, Rainbow, The Rolling Stones, Black Sabbath as well as other wide-ranging genres like Pop, Country, Folk and Blues. Like many, my own tastes started to form when I was at school in the late eighties (and college in the early nineties) and there were plenty of choices from that period but none of those artist's albums felt suitable for this or weren't already covered by one of the above scenarios. However, there was quite a large musical phenomenon that wasn't excluded by any of the aforementioned reasons and this has ended up providing the inspiration for my selection – the soundtrack. Soundtracks have always had their place, from The Beatles 'A Hard Day's Night' and 'Help' to 'Easy Rider', 'The Graduate' and of course the big boys on the block in 'Saturday Night Fever' and 'Grease'. While those are all legendary (albeit some from before my time) – and I did give serious consideration to 'Saturday Night Fever' as my mother owned it and it was possibly the first ever record I can remember actually playing – it is the ones from the eighties that mean far more to me. Like everything in the eighties, the soundtracks were massive in every sense of the word. The first one that comes to my mind is Queen's 'Flash Gordon' (another owned in our house and regularly played) which features in many of my early memories, especially 'Football Fight' (which is ironic as I went on to be a huge American Football fan in later years – both playing and coaching) and 'Battle Theme' (with the immortal Brian Blessed saying "Impetuous boy, ahhh well who wants to live forever.... divvvvvveeee!"). There is also 'This Is Spinal Tap', 'Footloose', 'Beverly Hills Cop' and Queen's 'A Kind Of Magic' where two thirds of the songs appeared in 'Highlander'. Despite these well-known and popular works, there were a couple of others that held fonder and more deep rooted memories for me and were the ones that I consideration for this review. The first of these was 'Rocky IV' which had such greats as Survivor's 'Burning Heart' and 'Eye Of The Tiger', John Cafferty's 'Hearts On Fire', Touch's 'The Sweetest Victory', Vince DiCola's 'Training Montage' and one of my all-time favourite songs in Robert Tepper's 'No Easy Way Out'; it was one of the first CD's I was given and owned. Another that everyone had on cassette at school was the 'Top Gun' soundtrack with Kenny Loggins' 'Danger Zone' and 'Playing With The Boys', Cheap Trick's 'Mighty Wings', Loverboy's 'Heaven In Your Eyes', Teena Marie's 'Lead Me On', Harold Faltermeyer and Steve Steven's 'Top Gun Theme' and of course Berlin's chart smash 'Take My Breath Away'. These were early considerations, but in the end I passed on these because there were three others that held fonder memories. The first of these was 'The Crow' soundtrack, a film I was introduced to by a very close friend at college. It will forever remind me of one of the greatest times in my life (at college) and an important old friend. Although it is Gothic in some ways – which is a big part of my listening these days – it is not exactly my normal Gothic (ie Symphonic/female Fronted) type listening being quite Industrial as well. Notable entries include The Cure's 'Burn', Stone Temple Pilot's 'Big Empty', Nine Inch Nails' 'Dead Souls' and Medicine's 'Time Baby III'. Jane Siberry's 'It Can't Rain All The Time' remains a song that brings a lump to my throat and tears to my eyes even now with lyrics that remain ever relevant and truthful. However, just notable songs and one all-time favourite isn't enough for this prestigious entry so third place is awarded to 'The Crow'. The runner up ended up being the soundtrack to the first VHS video I ever bought and a favourite film to this day... 'The Lost Boys'. This was another tape that everyone at school had to have and one I have enjoyed returning to many times with Lou Gramm's 'Lost In The Shadows', Echo & The Bunnymen's 'People Are Strange' (as true today as ever!) and Roger Daltrey's 'Don't Let The Sun Go Down On Me'. The two songs I adore the most are Gerard McMann's 'Cry Little Sister', a track that still gives me goose-bumps every time I listen to it to this day, and INXS and Jimmy Barnes' 'Good Times'; the latter being a song that started a lifelong love affair of Barnes (who will be part of said Fireworks feature). I started a couple of early drafts for this little beauty but from my early years there was another that ended up just tipping the scales in its favour as the winner. This was the soundtrack to my all-time favourite film for many years. I still remember the first time we hired it from a video shop (bloody hell, do you remember them?) and loved it from the first viewing. It took some serious searching to end up buying the VHS copy of the film, I ended up joining a video club to be able to get my hands on it; I still own that same copy today... almost twenty-five years later. Not only did I love the film for the action, the story and the film itself, but the one thing that really grabbed me was the awesome soundtrack and I hunted for the CD of this film for absolute years (the import was stupidly expensive!). In the end, I visited Bournemouth for the hell of it and a day out with a friend and whilst there took a wander into MVC (Music Video Club – do you remember that store too?) and there in the soundtrack section was the CD I'd coveted for so long. That film and that soundtrack was 'Iron Eagle'. It might be just me, but there are often seems pairings or trio of films that come out close to each other that are similar in subject matter ('Volcano'/'Dantes Peak', 'Mission To Mars'/'Red Planet', 'Armageddon'/'Deep Impact' are ones that comes straight to mind); in 1986 it was 'Top Gun' and 'Iron Eagle'. The former may always be better for some and more widely known in the public consciousness for sure, but the latter is full of artists that I am sure are even more loved and recognised by the esteemed readers of 'Fireworks' and 'Rocktopia'. 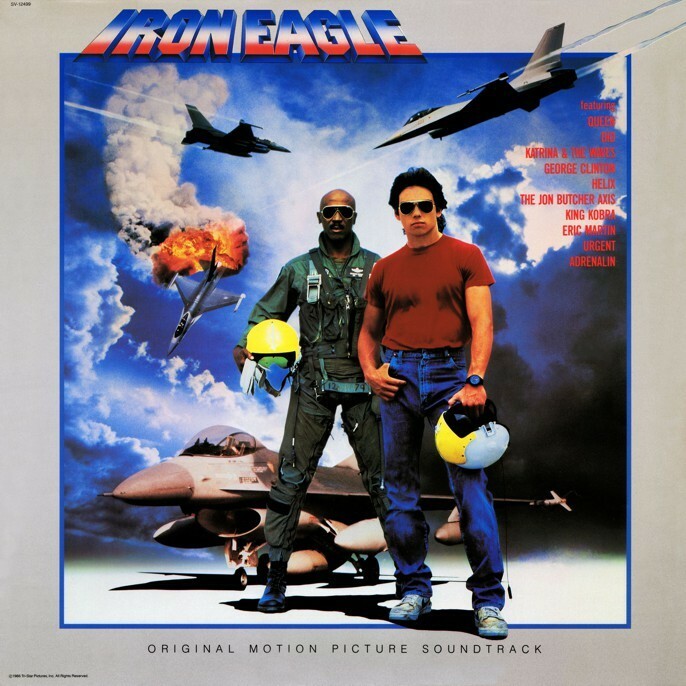 I would argue that the music in 'Iron Eagle' plays an even bigger part of the storyline than it does in 'Top Gun' (despite this being the better-known and more successful soundtrack). This is due to the fact that whilst the music featured in 'Top Gun' simply added to the scenes, in 'Iron Eagle' it is part of the story because the lead character Doug Master (played by Jason Gedrick) constantly plays music on his Walkman (google it kids) throughout the film to help him "get into the groove/rhythm". The album opens in sensational fashion with the truly legendary Queen and their well-known track 'One Vision'. I have always found it interesting that this was taken from the aforementioned 'A Kind Of Magic' album which itself is the unofficial soundtrack to another film. The song appears a couple of times in the film with Master in a simulator and then as the film really gets going, playing a part "assisting" the two main characters to "make up time" and during the first battle. This has always been a huge Queen favourite due to its inclusion in the film. This is followed by another act that I am guessing is well-known to our regular readers, King Kobra and 'Iron Eagle (Never Say Die)', which was the music that featured over the end credits. Despite 'One Vision' being a Queen single in itself, it was this track that had a video made for it to promote the film, featuring Louis Gossett Jr putting the band through a boot camp; it's very eighties and you can check it out on YouTube. Mr Big's Eric Martin is the next to make an appearance with the lovely ballad 'These Are The Good Times' and then it is the turn of Katrina And The Waves with the groovy 'Maniac House', a song I have often added to compilations for various house parties. The album then takes a step away from Rock with George Clinton's Funk/Soul offering 'Intense'. This precedes another "utter Rock legend" in the shape of Dio's 'Hide In The Rainbow' which featured during another one of the film's battle scenes. Although this album includes many good songs, the next offering has always been a favourite since I bought it and that is Helix's 'Too Late' with its riff-driven chorus and catchy chorus. This soundtrack closes out with the Urgent ballad 'Love Can Make You Cry' and Jon Butcher Axis' Melodic Rock 'This Raging Fire'. I have bypassed one song on this ten track beauty so I can to mention it individually at the end as it was one of the main reasons I wanted the album. To me, the highlight selection was the wonderful 'Road Of The Gypsy' from Adrenaline. It is a song that appears in the film a couple of times during reflective moments for Masters. It's a song I have on several compilations for my car and I've played it more times than I care to count. Along with Tepper's 'No Easy Way Out', it's something I play when I have lots on my mind and just want to hit the open road and try and drive them away. I have always thought it a beautiful song with great lyrics, good guitar, soothing keyboards and a rather fabulous sax solo. Back in 2013 (for issue #56), in a strange twist of fate, Paul Jerome Smith (my predecessor as Reviews Editor) assigned me the review of the re-issue of Adrenaline's 'Road Of The Gypsy' album which, of course, this was the title track of. I have no idea to this day if I might have sometime mentioned my love of this song or if it was purely chance, but I am still chuffed to bits that I was able to review the album this song came from. The biggest let down was the fact that some of my other favourite songs from the film were not on the version that I found. The Spencer Davis Group's 'Gimme Some Lovin'' is a song that has featured in multiple soundtracks (including 'The Blues Brothers' and 'Good Morning Vietnam') and I've always enjoyed it. It appears in a battle scene and I was surprised to see it omitted from the track-listing, given it had appeared on others. Another massive song that didn't feature on the CD was Twisted Sister's inspirational 'We're Not Gonna Take It' which showed up during the film in a scene where the main characters set about "not taking it". The lack of these songs was a slight disappointment but I had them elsewhere so not a huge deal. However, there was one other missing gem that was a real "kick in the nuts" because, along with 'Road Of The Gypsy', it was the only other song in the film I really, really wanted to own that I didn't have. Rainey Haynes' 'I'm Old Enough To Rock And Rock is a rip-roaring up-tempo offering with a punchy beat, shinning keys and a supremely infectious chorus to shout from the rooftops. It appears in the film during a race between a Masters in a Cessna plane and the local bully on a motorbike and, for me, makes that scene one of the film's best. I still get shivers when I view it when it and the song hits the crescendo. I eventually found a copy of it and also have that in the car... not the wisest of decisions as it always reminds of that scene and on an open road it implores... nay... insists without argument you put the pedal to the metal. I remember playing it repeatedly the last time I had a truly open back road and wow... driving a Civic Type-R is fun anytime, driving it that day on a clear and winding road with this song playing (and a few others occasionally interspersed) was a memory for life! So there you have my offering to you our dear readers. Not an all-time favourite album, not a Top-Ten release and not even one that inspired me. 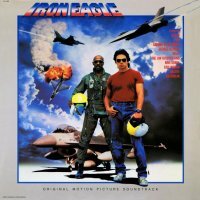 The 'Iron Eagle' soundtrack is simply an outstanding Rock release from a film that was my favourite for many years and one that maybe lesser known than many of its compatriots, yet features several bands that many 'Fireworks' and 'Rocktopia' readers will, I am confident, know and hold dear. The favourite film may now be different given my wiser years but it's still a very sentimental motion picture to me. If you haven't ever listened to this album, I urge you to go dig around for it especially if you are a regular reader. If you haven't seen the film then go find it, grab yourself a large tub of popcorn and some beers, switch off your brain and settle in for some serious eighties fun. It was a time when anything was possible... even a teenager stealing a fighter jet from a base to fly to the Middle East to battle experienced pilots and rescue his father... aided by some seriously Rocking tunes of course.